Ensuring a balance between the water needs of communities, industries and the environment is key to achieving a healthy Basin. Over the last few decades, overdevelopment within the Murray–Darling Basin led to more water being extracted from the catchment than could be replenished, and the overall health of the Basin was declining. The Basin Plan aims to find a balance between the water needs of all Basin users, to make sure communities, industries and the environment continue to thrive. To improve the health of the Basin, the Plan outlined extraction limits on the amount of surface water and groundwater that can be taken from Basin river systems to ensure sustainable use into the future. These limits, also known as sustainable diversion limits, regulate the amount of water that can be used by communities and industries both within catchment areas and across the entire Basin. 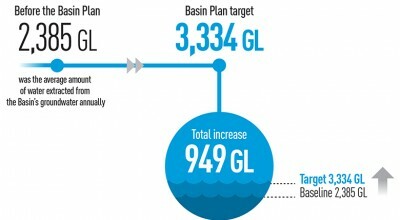 By assessing the amount of water needed to achieve the best possible outcomes for communities, industries and the environment now and into the future, the MDBA determined 10,873 GL of surface water and 3,324 GL of groundwater per year across the Basin could still be extracted – the same amount of water within 28 Sydney Harbours. 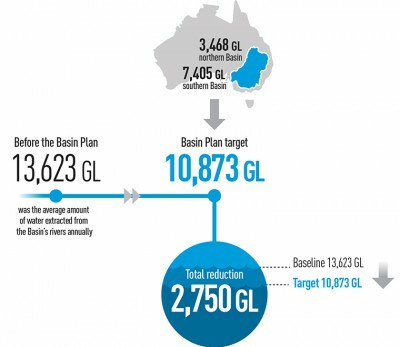 At the time of assessment, surface water use across the Murray–Darling Basin was 13,623 GL per year. This means, extractions need to be reduced by 2750 GL per year to meet the new sustainable diversion limit. A fair and equitable strategy was developed to reduce surface water use across the entire Basin by 2019. Commonwealth and Basin state governments have been working together to achieve the sustainable diversion limits in a way that provides benefits for both communities and the environment. These include providing funds to farmers and businesses to upgrade their irrigation infrastructure. This makes sure water is transported and used efficiently on farms, with the water savings counting towards the reduction. Another way is to buy water entitlements off willing sellers who don’t need them anymore, with the entitlement volume also counting towards the reduction. This year, there is the potential to adjust the Basin-wide sustainable diversion limit. The limit could be increased if proposals show the environmental health of the Basin can still be maintained without the need to recover as much water. Or, the limit could decrease if proposals show the recovery of more water would have no affect or even improve social and economic outcomes. By improving the health of the Basin’s river systems, the many benefits will be felt by individuals, communities and industries. A healthy environment will provide improved recreational benefits for local residents, tourists and businesses, as well as supporting water quality suitable for irrigation, domestic and urban water supplies.